First, let's determine the wrist size. Wrist size can be measured by wrapping a string around the wrist and measure it's length. The string shows a 17cm wrist. When choosing a strap, it is the length of the "buckle end" that plays the most important role. 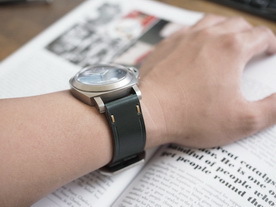 The length of buckle end controls where the buckle sits on the wrist. the buckle will not hit the table top. The above numbers are general guidelines. If you are unsure about sizing, when checking out from our website, please leave us a note letting us know your wrist size. For ammo straps, we encourage choosing one size up as ammo straps tend to look better with slightly longer tail. What about the lug pin to lug pin measurement? Do you subtract that from the wrist circumference? You don't have to. All I need is your actual wrist size.